I did a double take at my calendar this morning, Thanksgiving is next week? Wait. What? I missed a week somewhere. Between the blogging and instagram community in full deck the halls mode and us just celebrating Charlie's birthday last weekend (he turned 7 in October! ), I'm all out of sorts time wise. Since I'm hosting, I decided to get my thoughts together on what I'm serving and how I'm planning my time. (The new Barefoot Contessa Thanksgiving special yesterday helped!) I (like everyone else) try to make as much ahead as possible, so the kitchen isn't pure chaos on Thanksgiving day. 3. Plan table setting, buy new linens or candles if needed. 2. Last minute forgotten groceries run (inevitable) - usually Jimmy's job! 1. Several hours before dinner: Prepare turkey (recipe) - making a breast instead of a whole bird this year since there will only be 6 of us! 3. An hour before dinner: peel and make make mashed potatoes, roast butternut squash (toss with pecans and dried cranberries before serving), finish green beans - warm them up by tossing in pan with olive oil and browned shallots. Warm up apple and herb bread pudding. (This all sounds like a lot, but really it is just putting things in the oven or tossing them in a pan. The only thing requiring minimal work is the mashed potatoes - Charlie's favorite! Uncork wine. I'm sure you noticed a theme with the recipes. Ha. I stick with my girl, Ina, for holidays like Thanksgiving. And if the recipe isn't hers, then it's likely my Mum's. I should note, I do have two ovens which helps a bit (even though one is teeny tiny) since the gratin, turkey, bread pudding, and butternut squash will overlap in time. Also, when planning a menu this big I have a wild card, an item that I'd like to make if time is running smoothly and I'm enjoying myself, but I can easily cancel too if needed. In this menu, it's the potato and fennel gratin. I'd like two potato dishes, but if it doesn't happen it really doesn't alter the menu much. I will just make it on Friday to have with leftovers instead. Also, we still need to eat breakfast, lunch and dinner on Tuesday and Wednesday and I don't want it to be fast food and take out, so I try to have easy nibbles for those meals so the boys (including Jimmy) can help themselves. It just isn't fun to be in the midst of prepping a holiday meal then stopping to prepare another. Enjoy the prep and planning but don't stress the small stuff. Everyone enjoys the day more when the cook is relaxed and it's not all too perfect. 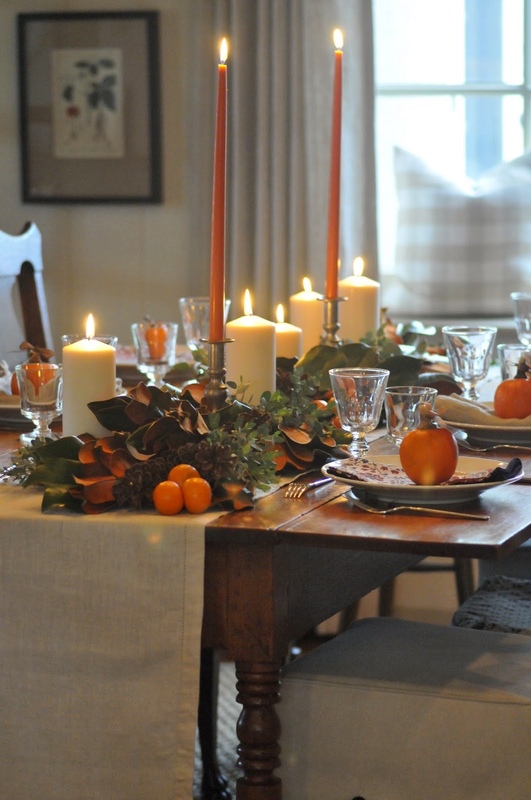 Love hearing how you plan and organize Thanksgiving! Can't wait to try a few of your recipes... Or Ina's;) Happy cooking! ps you always find the best little Christmas tidbits. I've loved many of your wrapping papers, IKEA finds or fave Christmas treats and packaging (etc) that you stumble across over the holidays. Keep us posted as you find little treasures! The Holidays do come up fast it seems! We also do just the turkey breast. Mashed potatoes I make ahead and just warm up in oven. Anything to make it less work on the day of hosting! Have a Happy Thanksgiving! I love to see all your Christmas ideas too! Yeah, who am I kidding?! I will be sampling much sooner! Ha. Happy Thanksgiving!! I can hardly believe Thanksgiving is next week. I enjoy seeing your process and planning. I'm curious how you will make the gravy since you're only serving a breast? Same as with while bird! :) the breast with the bone in also comes with neck and giblet and I should get 1/3 drippings after roasting for a couple hours. Let's hope anyway!! Happy Thanksgiving to you and yours! I love the cooking and prepping of Thanksgiving but I am not hosting this year. We are headed to my sisters house. But I had the thought yesterday that we will be back home for dinner...Thinking I need to do a toned down version for the three of us. Hope you have a great week! Yours sounds amazing. Great plan and yummy menu. Enjoy! Your table is lovely! I'm wondering how you have the greens placed; are they laying directly on tablecloth? Or in water somehow? Thanks! Please post your recipe for a whole bird!